The performance of U.S. students in reading and mathematics has remained relatively flat since 2015, according to the results of the National Assessment of Education Progress, released today by the National Center for Education Statistics. An increase in reading scores among higher-performing 8th-graders was the only significant improvement, but those increases were offset by a lack of growth among lower-scoring students. A similar trend was seen in 8th-grade math, with average scores of those scoring above the 75th percentile increasing and the scores of students below the 50th percentile decreasing. At the 4th-grade level, there was no significant change in students’ scores or in the percentage of students scoring in the proficient range in reading and math, but among those scoring below the basic level in both areas, there was a decline in scores. Last year’s administration of “the nation’s report card” was the first to be conducted in a digital format, which some state officials have suggested could affect the results. But Peggy Carr, associate commissioner of assessment for NCES, said in a conference call with reporters on Monday that the agency went through an extensive process of equating results of the digitally based assessments with paper-and-pencil versions, and that the differences were similar to what would typically be found as a result of "sampling variability." In fact, the release of the scores, typically in October, were delayed until now because NCES needed the additional time to compare student performance on the two versions of the assessments. NCES began the transition in 2015 with small groups of students taking the online version, flipping the process in 2017 with the majority of test-takers using the digital platform. "We’re confident that these results are valid and are apple-to-apple comparisons for the states and for the nation," Carr said. "We are just ecstatic about being able to move these assessments into a digitally-based format." Trend in 8th grade reading NAEP scores. Overall trends since the early 1990s show that average scores in math at both grade levels were at their highest in 2013, with 285 on a 0-to-500 scale in 8th grade and 242 in 4th grade. 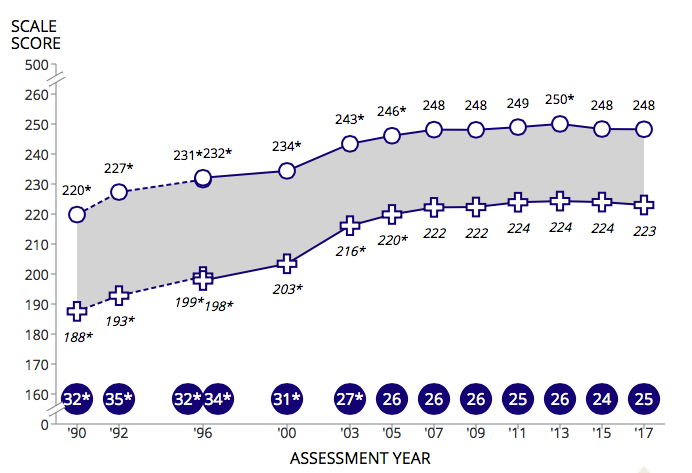 In reading, performance has held steady since 2005 and peaked in 2013 at 268 in 8th grade. 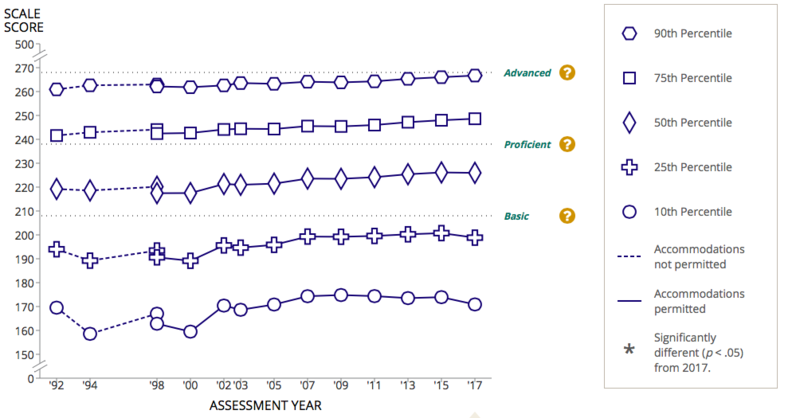 Since the beginning of the NAEP program, there have also been steady increases in the percentage of students in both grade levels scoring at the basic level or higher in both subject areas. Nationally, math and reading scores for student subgroups remained largely the same as in 2015, meaning that gaps between white and black students and white and Hispanic students also didn’t change. While math scores for students with disabilities dropped in 4th grade — from 218 in 2015 to 214 in 2017 — they remained the same for 8th-graders at 247. In reading, scores for students with disabilities increased at 8th grade and remained the same at 4th grade. One difference between groups of students shows up in connection with the type of school they attend. In keeping with the increases seen in reading among 8th-graders, scores increased for those attending public schools, while the scores declined for students in private Catholic schools. Reading scores also increased for 8th-graders in suburban schools while remaining the same in cities, towns and rural areas. Though scores appear to be increasing in some areas for students in charter schools, the results were not statistically significant because the sample of students in those schools is not large enough. Among ELL students, performance remained stable, except for a small increase in reading scores for 8th-graders, again reinforcing the improvements seen at that grade level. Math scores for students eligible for the National School Lunch Program dropped slightly at 4th grade. No change seen in achievement gap between white and black students. At the state level, the 2017 results show that Florida was the only state to see increases over 2015 in three areas — math at both grade levels and in reading at 8th grade. "Something very good obviously is happening in Florida," Carr said. Fourth-grade math scores also increased in Puerto Rico, and 8th-grade scores increased for the Department of Defense Education Activity (DoDEA). DoDEA was also among the 10 states that saw increases in 8th-grade reading. Ten states also saw decreases in 4th-grade math, and nine states experienced drops in scores in 4th grade reading. Alaska and Vermont experienced decreases in three of the four areas — 4th- and 8th-grade math and 4th-grade reading. NAEP’s Trial Urban District Assessment (TUDA) program measures performance in 27 of the nation’s urban school districts. The results show that reading scores dropped significantly among 4th-graders in Charlotte, Cleveland, Dallas and Detroit, and in 8th grade in Philadelphia. Duval County (FL), Fresno (CA) and Miami-Dade saw 4th-grade math scores increase, and San Diego saw increases in math and reading at both grade levels, with significant increases 4th-grade reading and math. In 8th-grade reading, Albuquerque and Boston saw significant growth. In 21 other districts, however, average scores did not change. In the San Diego Unified School District, Jim Solo, executive director of Leadership and Learning, says the district's approach to improving math outcomes at the elementary level has been a combination of updating the curriculum, supplementing it with additional materials and strategically using "Common Core resource teachers" to create units of study and provide coaching in schools with the most high-need students. "The focus of these cycles has been to put eyes on students who are struggling and do in depth observation and assessment of them," Solo says, adding that improving instruction in math has been "a team effort where all voices are heard and best practices are put in place to support and ensure that every child grows and develops in mathematics." Scores in SDUSD have been increasing on state tests as well, climbing from about 40% meeting or exceeding math standards on the California Assessment of Student Performance and Progress in 2015 to 46% last year, and increasing from about half in 2015 to 56% in English language arts for the past two years. This month, the state also recognized 16 of the district's elementary schools and one charter school as part of the California Distinguished Schools Program, in which test scores are among the criteria. Perhaps in response to a January report from the National Superintendents Roundtable and the Horace Mann League saying that NAEP’s proficiency term is misleading, the NAEP materials include explanations of the terms used for different levels of performance. Carr noted that while there is certainly overlap between NAEP assessments and those based on Common Core standards, the two types of assessments are not aligned and often measure different skills at different times. "We remain steady in what we measure because we are a common yardstick over time," she said, adding that NCES plans to soon release an item-to-item comparison showing differences between assessments of Common Core standards and the NAEP program. She also addressed the trend showing that the performance of lower-scoring students in reading is getting worse, noting that a similar pattern was found in December when NCES released the results of the Progress in International Reading Literacy Study (PIRLS). As part of the administration of NAEP, students, teachers and school administrators also completed surveys on the instructional climate in schools, such as how much access students have to digital devices for math and whether teachers spend time helping students interpret what they’re reading. Three-quarters of 8th-graders, for example, use digital devices at least once or twice a month to practice math skills or review for tests. And 22% of teachers reported that their students use devices in math every day or almost every day, but these students didn’t score any higher on the assessment than those who use devices less frequently. In reading, almost 80% of 4th-grade teachers report spending at least some time emphasizing skills such as making comparisons, examining a character’s motivation and connecting ideas. Reading scale scores were the lowest — a 183 — for students whose teachers reported no emphasis on these areas.